Our TTB1W White Kraft Tin Tie Bag measures 3 3/8" x 2 1/2" x 7 3/4" and is ideal for donut holes, cookies, biscotti, scones, and more. The flat bottom allows for easy filling for bulk items. An inner poly lining keeps products fresh. Resealable tin ties provide a secure closure. A trip to the bakery is extra special when your items are placed in this White Kraft Tin Tie Bag. TTB1W measures 3 3/8" x 2 1/2" x 7 3/4" and is ideal for holding donut holes, cookies, brownies, scones, eclairs, and more. The interior poly vapor lining keeps out moisture and air, so your product stays fresh. 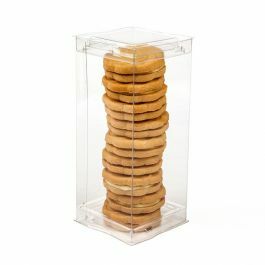 The reclosable tin tie top gives convenient access, allowing customers to easily open and reseal your product as needed. This bag works great for trips to the candy bin, too. Secure the bag closed by rolling down the tin tie top and folding the tabs into place. Customize by adding labels, stickers, or printed design. FDA approved. 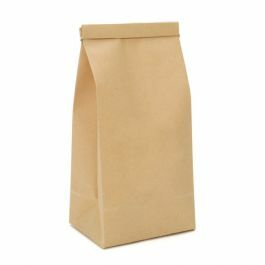 Outer Dimensions: 3 3/8" x 2 1/2" x 7 3/4"
The primary use for Tin Ties Bags is for short-term storage of bakery items and other dry goods. Products that need a longer shelf life may require a higher barrier.